Is Tesla’s Customer Experience Driving Car Dealers Over the Edge? Car dealerships have long had a reputation for anticompetitive tactics and influential lobbyists. So it’s no surprise that Dealer Associations nationwide have taken up arms against Tesla, an up-and-coming EV (electric vehicle) manufacturer that, in addition to making some seriously cool cars, has adopted an innovative direct-to-consumer model for selling them. And while car dealerships aren’t going extinct just yet, they’re scared of Tesla’s booming success and loyalty. Why? Because the typical car buying experience stinks, and most dealers know it. That’s why a new approach that puts customers first is a very real threat to “business as usual” in the automobile sales business. But their strong-arm tactics might be coming up short this time. The big issue here is that Tesla has strayed from the usual method of sale in the automotive industry. 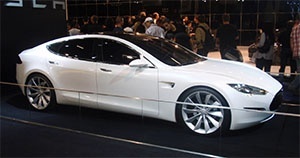 Rather than sell through third-party franchised auto dealers, Tesla owns and operates showrooms where customers can test drive the product, and if they enjoy it enough to make a purchase, custom build an order from the Tesla factory through a customizer on site. Unfortunately for Musk, automotive dealers are both old-school and have a lot of political clout—particularly at the state level. They may not be able to beat Tesla, but they’re certainly going to go down swinging. Automotive sales laws are largely regulated on the state level, and in several states, dealers associations and lobbying groups are fighting to keep Tesla from implementing its unprecedented strategy. So far, it’s neck-and-neck. Earlier this month, Texas legislators failed to support a bill backed by Tesla that would've loosened restrictions on automaker-owned dealerships. Meanwhile, Virginia's DMV rejected an application by Tesla to begin opening dealerships. But Tesla recently took Massachusetts and New York to court for the right to sell cars within their borders and won. The anatomy of anti-Tesla legislation, though, shows you just how out of touch auto dealerships are with customer experience. Two recent bills that were going through New York's state legislature would have made it illegal to register any new car not sold through a third party (i.e. a dealer). Put another way, if you make the car, you can’t sell it yourself. The rationale is that the dealership franchise system helps customers by increasing local competition. On the other hand, a sales model that eliminates all the costs of traditional dealerships probably helps consumers even more. Paper thin, right? By this point, dealers realize they’re expensive middlemen whose best days are behind them. If consumers develop a taste for this different car-buying experience that’s hassle-free and more economical, it’s game over for dealers. What Can You Learn From Tesla? Every industry has practices that annoy customers. In the automobile business, it includes the obvious poor experience most people have at a car dealership—pushy salespeople, stressful negotiation, endless upsells, etc. But that alone isn’t enough to drive most customers away. They need something to move towards – and Tesla’s given it them. Tesla’s approach is actually pretty simple at its heart: make the process of owning one better than that of owning any other car. And of course, this starts when you buy one. The reaction from customers? Pretty good. According to Musk, the lowest percentage approval rating Tesla has received in public surveys in regard to their direct sales approach is 86%. Not too shabby. But Tesla is doing more than winning over the hearts and minds of its customers. It’s winning over the public in general. There’s currently a White House petition gathering signatures in support of Tesla’s direct sales model. It gathered over 70,000 signatures in 25 days and is well on its way to reaching the 100,000 needed for official White House response. And it was all started by someone named Ken, an anonymous fan who just hopes to own a Tesla someday. Talk about devotion to a brand. The fact that Tesla is inspiring so much fear in the hearts of its competitors simply shows how effective they think Tesla's strategy is. It is a direct threat to their livelihoods - not because Tesla is trying to bankrupt anyone, but simply because it has produced a revolutionary product and assigned an according strategy of selling it. I hear many companies say they want to differentiate on customer experience. But most shy from the reality of actually disrupting their industry. But the truth is, smarter customers are more and more aware of what they want (and increasingly demand) in their buying experiences. It’s true in the auto business, and its true in yours. All you need to do is find out where your customers pain is – and make it go away. This blog originally ran on CMO.com, where Michael Hinshaw writes the weekly "Get Customer-Centric" blog.